Usually for "A Gord's Eye View of Toronto", I like to take my own pictures. 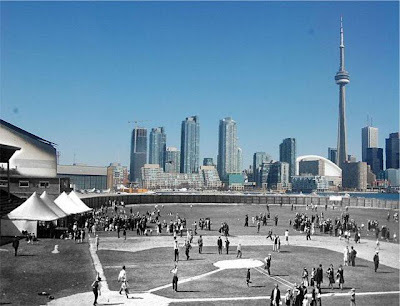 But I came across the picture above on the web and started to explore the history of professional baseball on the Toronto Islands. 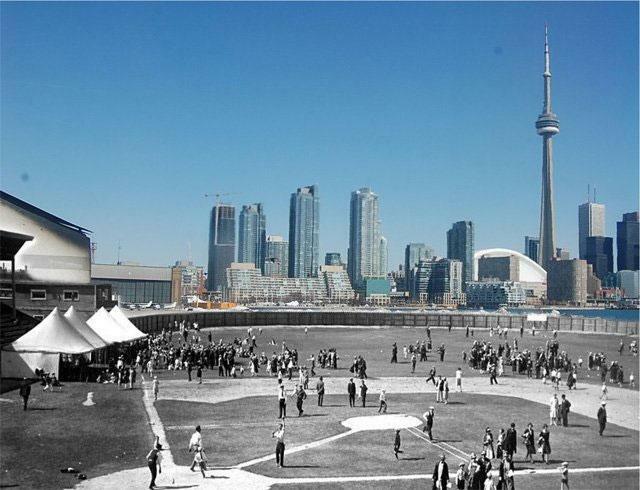 It is a remix of two photos, one past and one a recent one, showing the views fans at the old Hanlan's Point Stadium on the west end of Toronto Island would have had if the stadium was still around today. 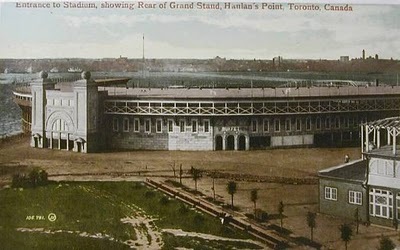 The original stadium was built in 1897 and was where the Toronto Maple Leafs played in the International League. The stadium was destroyed by fire on September 13, 1903. It was quickly rebuilt for the following season and in 1908, a new stadium, Maple Leaf Park, was built. It is the black and white shot above with the roller coaster to the right. Must have been a spectacular fire to view form the city! A new concrete stadium (above) was built with with over 17,000 seats in 1910 and at the time was the largest in minor league baseball. It is also famous for being the stadium where Babe Ruth hit his first home run which ended up in the waters of Lake Ontario way back on September 5, 1914. The Maple Leafs moved out after the 1925 season to a new Maple Leaf Stadium (above) which was built on the mainland. I still remember going to games here with my dad to see the Toronto Maple Leafs play. The stadium was closed in 1967 and torn down in 1968. Cool pix ... especially the first and last ones.